I want to send a big thank you out to the folks at Mary Lou’s Weigh for asking me to try out their new “weigh platform” scale. Actually, it’s not really a scale. It’s a kind of motivating keeper of secrets. First, you step on the platform and it records your starting weight, only it doesn’t tell you what it is. Then you step on it again in a day or two and it will tell you if you are higher or lower than you’re starting weight. If you’re lower, music starts playing and the blue and green colored buttons light up. I admit I was a little startled the first day that happened. I mean, I’m half awake, naked and cold in my bathroom at 6 a.m. – hardly the moment I’m expecting to hear Mary Lou Retton’s voice congratulating me on losing a half a pound! It made me laugh, though, and even happier to know that I’d lost a half pound. If you gain weight, it will tell you how much and Mary Lou offers you some helpful tips in her trademark peppy voice. The platform is spot-on accurate because I’d weigh myself on my actual scale before getting on Mary Lou’s Weigh. I’d gained a few pounds during November (a tale I’ll tell after the holidays) and so I’d been working to lose that weight. Lose them I did and I was glad to have Mary Lou cheering me on. I admit, though, that I’m a numbers girl. Have been for nearly four years. Having said that, I would probably have opted for this platform type of weighing in when I started losing weight because seeing numbers on a regular basis kind of messed with my head after awhile. The platform is in keeping with my philosophy of “10 pounds at a a time,” meaning I concentrated on losing 10 pounds and then the next 10 pounds and so on. 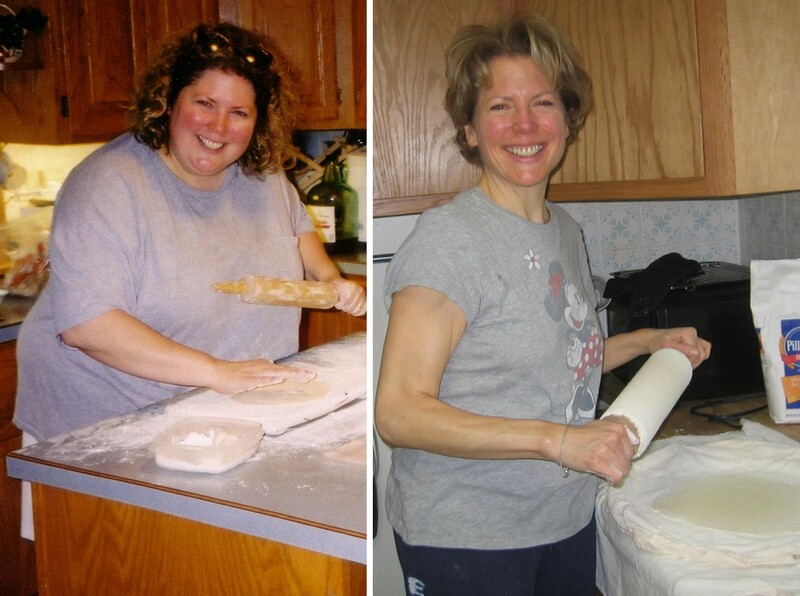 Roni over at Roni’s Weigh also received a Mary Lou platform and thought it was “GENIUS!” Roni is in maintenance and isn’t looking to lose 10 pounds, so she decided to give hers away to someone who’d benefit more from the “scale’s” approach to weight loss than she would. I agreed and offered mine for giveaway, too. Congrats to Deidre from Clever, Missouri (what a great name for a town!) for winning my platform! I hope it reflects great success for you. 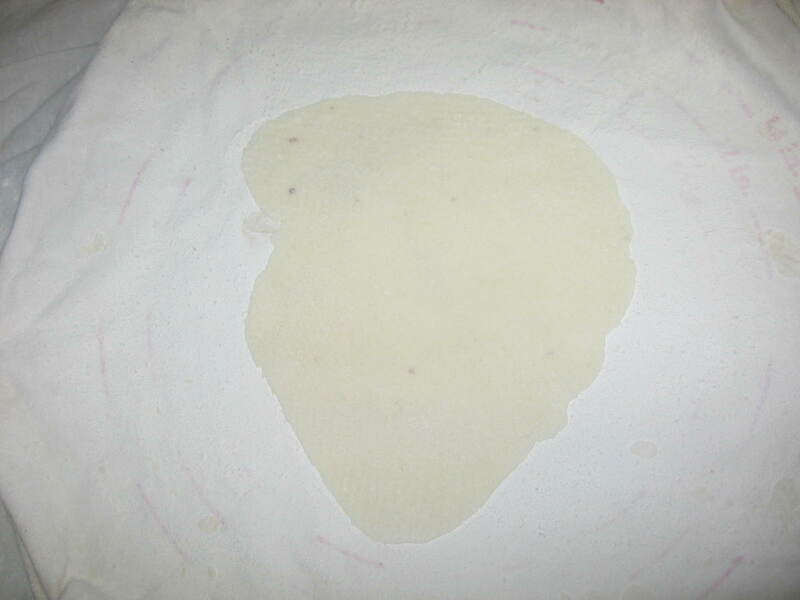 Well, my girls and I made lefse yesterday. And what a day it was! 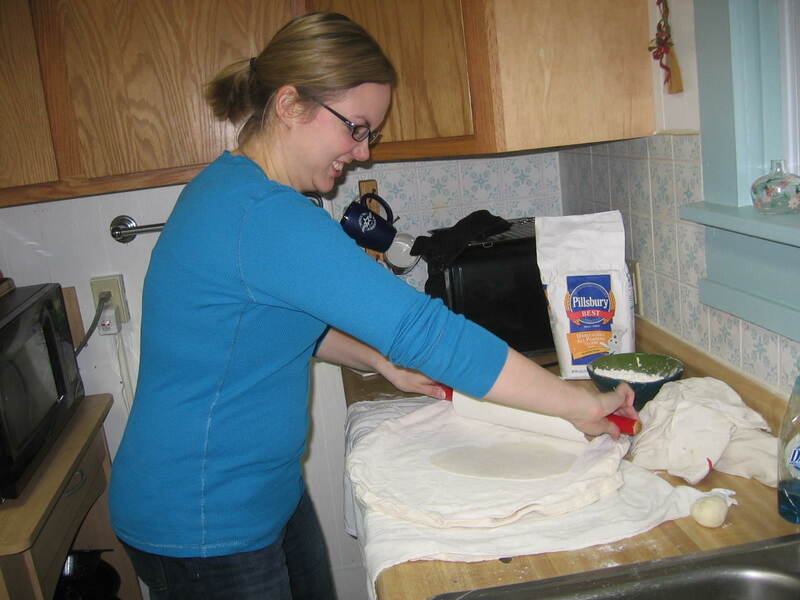 Carlene and Cassie had never made lefse before so watching them perfect their rolling skills was quite amusing. And Carlene rolled a round that looked like Jay Leno. We thought about selling it on eBay. 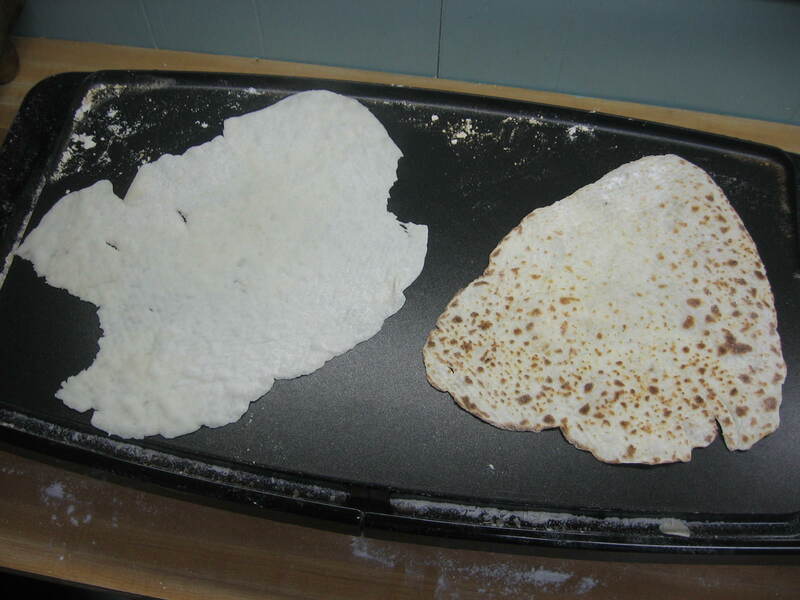 Here’s a comparison shot from the first time I made lefse (nearly 300 pounds) and yesterday (128.3 pounds). I think I notice a bit of difference in the face, don’t you? LOL Actually, the biggest difference for me personally was that I stood for nearly three hours without back pain. 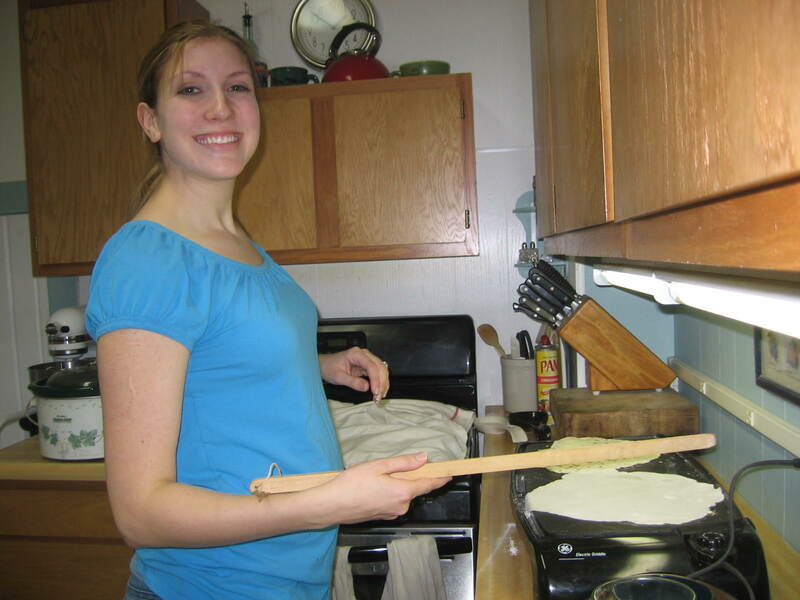 The first time I made lefse, I had to sit frequently. And of course, the highlight of my day was seeing g-baby Claire. Here we are, with my hands covered in flour and getting it all over Claire, but she doesn’t care. She kept Carlene, Cassie and me amused all afternoon. Amazing the fun she has with Tupperware and wooden spoons. Happy 24th birthday to my own baby girl (and mother of Claire and g-baby #2 on the way), Cassie! You make me so happy, honey. You were, and remain, the best surprise ever. 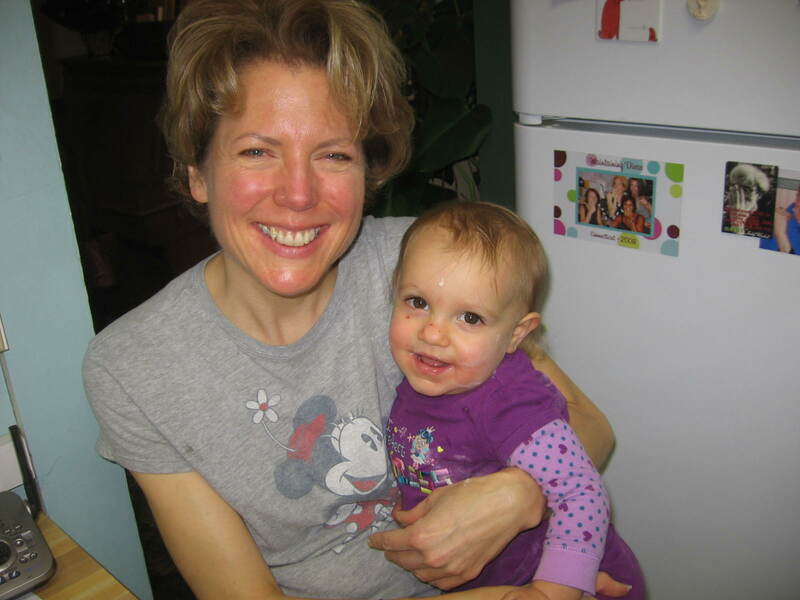 This entry was posted in Uncategorized on December 12, 2008 by Lynn Haraldson. I reviewed the Mary Lou’s Weigh as well. I had the same assessment. I’ve still been playing with mine, and the more I use it, the more fun it is. It’s a very positive tool, and I think that’s a good thing.And your pictures are amazing!! This is really sweet! I love seeing you with your kids and granddaughter, passing on the traditions from generations past! This is so wonderful and makes me smile. I don’t have any traditions/recipes/memories like that from my own grandparents or parents, so I hope someday I have grandkids coming to pass on traditions that I started. Loved the pictures, you still have that great smile no matter your size *smile*. Looks like you had a great time yesterday. Thanks for the review of the scale I will take a look. I’m up to 3 scales already though so don’t really need a new one lol. If I can hear Mary Lou’s voice telling me off, preferably with a lot of swearing, after gaining several pounds, then I think I need one of these. Charlie, I’d have kept the scale if Mary Lou swore at me every time I gained a half pound. I learn best through yelling 😉Sabrina, you can post your comments here, or look in View My Profile for the address.